Watch out, everybody, the Optimus Popularis has gone from foam mockup to proper-looking prototype. (We’re really digging that full-length display in the space bar.) With any luck, we won’t have to watch this one develop over the course of 2-3 years like we did the Maximus — and with a little more luck, this one will be easier to type on, too. We learned that Art Lebedev was planning a new, smaller and “cheaper” addition to the Optimus keyboard lineup with the “Popularis” a while back—but the mockup was basic to say the least. While no new information has been released, we do have a brand new, detailed, 3D mockup to drool over. Art Lebedev Studio’s namesake founder today provided first details of Optimus Popularis, a new model in the company’s lineup of display keyboards. Presented only as a mockup so far, the Popularis is billed as a smaller alternative to the Maximus that will shrink the design by moving the programmable keys to the top and shrinking the overall size of the keys themselves. Costs will be shaved primarily by switching away from OLED; Lebedev doesn’t explain what will replace the standard but promises a “totally different principle” behind the keyboard, suggesting a more advanced or unique approach to giving each key a display that can be reprogrammed on the fly for different apps and operating systems. 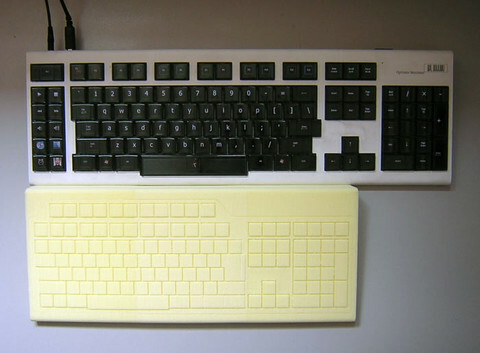 The keyboard is still too early in its design phase to be given a release date but is already projected to have a price below $1,000; the current Maximus keyboard sells for approximately $462 and thus hints that the Popularis may have more advanced features than its ancestor. Art Lebedev Studios, the team behind the Optimus Maximus keyboard, have released some fresh (if scant) detail on their next project. 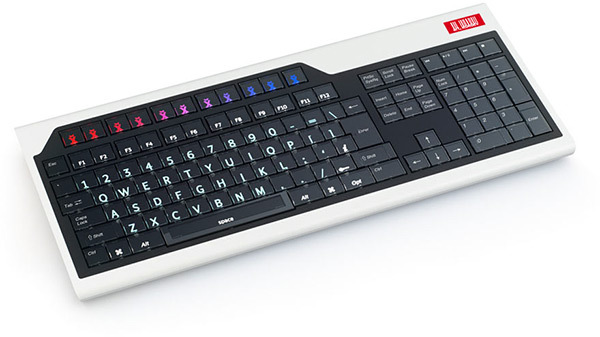 Named Optimus Popularis, as the name suggests it’s another keyboard but one aimed more at general consumers. Estimating a sub-$1,000 final pricetag, it apparently won’t use OLEDs for the keys but “will be based on a totally different principle”. Other than that, the fact that the keyboard is shorter than the existing Maximus, and the extra row of keys being moved to above the function keys (and gaining another button — eleven on the Popularis compared to the ten on the Maximus), little is known. Presumably it’ll still be another case of having displays for some or all of the keys, but Lebedev’s suggestion of a “different principle” opens up the possibility of alternative technologies to OLED being used. Using OLEDs gave particularly bright and low-power images, but supplier issues severely delayed the Maximus’ launch. One possibility is a switch to ePaper, such as developed by E Ink and currently used in the Amazon Kindle, Sony Reader and iRex’s e-book range. E Ink’s Vizplex technology can produce print-crisp characters, require no backlight and only draw power when the image is changed. There’s no timescale for the Popularis, but we’ll bring you more detail as we get it. Art Lebedev has unveiled plans for a new addition to the Optimus keyboard family with a keyboard dubbed the “Optimus Popularis.” Details are scarce as the device is only a mock-up at this point—but we do know that it will be shorter than the Maximus, and it it will not use OLED screens to save cash. Instead it will be based on a “totally different principle” (ooh, mystery principle!). Naturally, no release date has been unveiled, but look for it to retail under $1000.